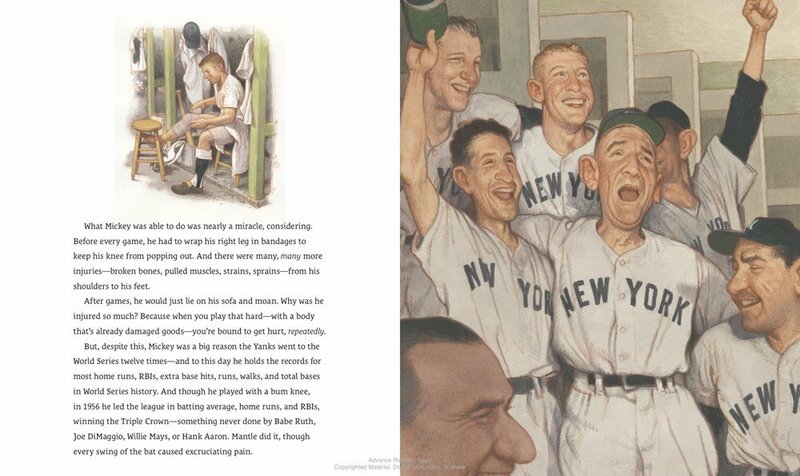 Summary: Right from the author’s note before the title page, it is clear that Mickey Mantle was a flawed character. The note mentions the poverty and abuse that marred his childhood, as well as the alcoholism that led to his death at the age of 63. But it is equally clear that Mantle was an amazing baseball player, chosen to replace the legendary Joe DiMaggio on the New York Yankees, and a winner of baseball’s Triple Crown in 1956 (league leader in batting average, home runs, and RBI’s), a feat not achieved by DiMaggio, Willie Mays, Babe Ruth, or Hank Aaron. He could belt powerful home runs from either the left or the right, and could run from home plate to first base in 2.9 seconds…until a debilitating knee injury raised his time to 3.1. Plagued by injuries, he still led his team to the World Series 12 times, and, although fans knew he wasn’t perfect, they cheered him on for 17 years. 40 pages; grades 2-5. 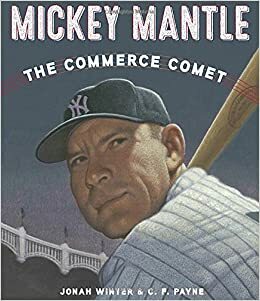 Pros: The large full-color illustrations bring Mantle’s story to life, told in a conversational voice with a slight Oklahoma (Mantle’s home state) twang. Cons: I could have enjoyed a seeing a photo or two.